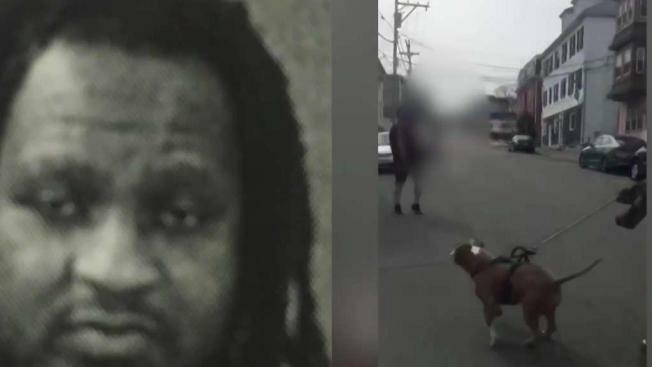 According to court documents, Jerry Chery yelled for the leashed dog to "attack"
A New Bedford, Massachusetts man is being held without bail after police say he ordered his pit bull to attack a 13-year-old girl. A Massachusetts man is being held without bail for allegedly ordering his pit bull to attack a 13-year-old girl in New Bedford last week. Jerry Chery, 28, of New Bedford, was arraigned Tuesday in New Bedford District Court on numerous charges including assault and battery on a child with injury, assault to maim, assault with a dangerous weapon, and disturbing the peace. According to court documents, the victim, from New Bedford, was bitten four times on her right arm, left leg and back and required treatment at an area hospital. The April 5 attack stemmed from a disagreement between the victim and Chery's stepdaughter. Court records say Chery yelled for the leashed dog to "get her" and "attack." The victim, Victoria Santos, said the whole ordeal was "scary" and that Chery shouldn't have done what he did. "If you're going to fight somebody, you fight them one on one or you prevent the fight from happening," said Santos. She said she was surprised at how the whole thing unfolded and because of the incident, she's now afraid of dogs. "It's like scary. Like I'm in love with dogs, but now I don't want to be near them at all," said Santos. "I barely eat. It's hard to sleep." Chery was held without bail pending a dangerousness hearing scheduled for next week. "He shouldn't have done that and now he's going to get what he deserves," said Santos.